I recently bought a Google Nexus 7 tablet to take on holiday with me instead of a laptop. The Nexus 7 is much smaller and lighter than a laptop, and you can easily carry it around with you all day if you wanted. It's probably not much good if you want to organise or process some of your photos. But I never have time for that when I'm on holiday anyway. The only thing I use the laptop for is transferring images from my memory cards to my backup hard drives. The Nexus 7 can do the same job but without the weight and bulk of a laptop. Now, one of the other things that the Nexus 7 (and probably most other android tablets and phones) can be used for is to control your camera. There are a number of different apps available. 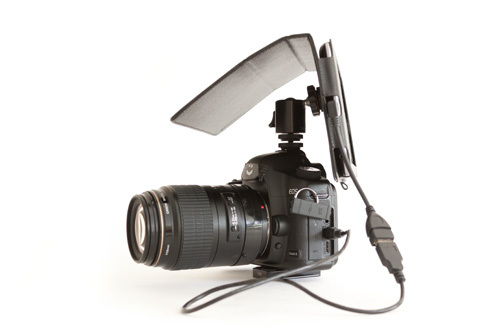 One of the most highly regarded is DSLR Controller, though this is currently only for use with certain Canon DSLRs. I haven't tried DSLR Controller myself, as it is a paid app. I want to see whether controlling the camera from the tablet is really useful for me before I purchase the app. Instead I have been using the free Helicon Remote app. The free version only lets you save files in small JPEG, but this is good enough to get an idea of how useful having control of your camera from the tablet is. As well as an app to control your camera, you also need what is known as a USB OTG (On The Go) cable. This has a male micro USB connector on one end that plugs into the tablet, and a female standard USB socket on the other end. Then you need a male mini USB to male standard USB cable (you normally get one with your camera). 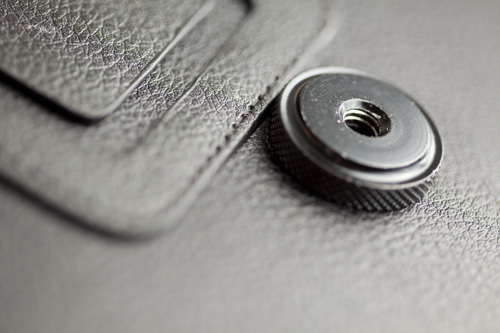 The mini end plugs into the camera, and the standard end plugs into the female socket of the USB OTG cable. This connects your camera and tablet together. With the camera and tablet connected, you can load up the DSLR control app on the tablet. When it detects the connected DSLR, it pops up a message asking if you want to use the app to control the camera. Click OK, and then you can control the camera from the app. The Helicon Remote app has a lot of different options, and you can autofocus, focus bracket, change exposure, etc. For me, the main things are liveview and the ability to trigger the camera's shutter. I tend to use manual lenses, so control of aperture and focus is not available from the app for me. The main problems I have with the app is that the liveview feed is quite slow, and there also seems to be quite a bit of lag. So it's no good for capturing action. Even quite slow movement can be difficult due to the lag. I understand this is one area where the DSLR Controller app is meant to be much better. Unless you are shooting in a studio situation, you probably want some way to attach the Nexus 7 to your camera. I didn't find much info on this on the web, but did find this post here: Nexus 7 mounting bracket for your DSLR rig. The solution they used looks nice and secure, but unfortunately buying the RAM parts they used in the UK is very expensive. So instead I cooked up my own solution. I bought a standard case for the Nexus 7, and then glued a 1/4" thread nut to the case. I then used a hot shoe to 1/4" screw adapter in the camera's hot shoe. Onto this I screwed a mini ball head, and onto that I screwed the Nexus case. The Nexus 7 case I bought is this one made by Mofred (cost around £10): Black Luxury Multi Function Standby Case with Built-in Magnet for Sleep / Wake feature for the Google Nexus 7 Tablet Android 4.1 Jellybean 8GB or 16GB - New Updated Version Perfect for Nexus 7 w/ Sleep Sensor and Stylus Holder Loop + Screen Protector + Stylus Pen by MOFRED® (Available in Mutiple Colors). The 1/4" thread nuts and hot shoe to 1/4" thread adapter I bought from ebay (£2): 1/4"-20 Tripod Screw to Flash Hot Shoe Mount Adapter . The mini ball head I already had, my model is an FLM Centerball 18. But if you don't have one, you can buy a mini ball head plus the hot shoe to 1/4" screw adapter for only £4.35 from Link delight on ebay: 1/4" Hot Shoe Mount Adapter For Camera And Monitors D2C. What is using a tablet with your DSLR useful for? 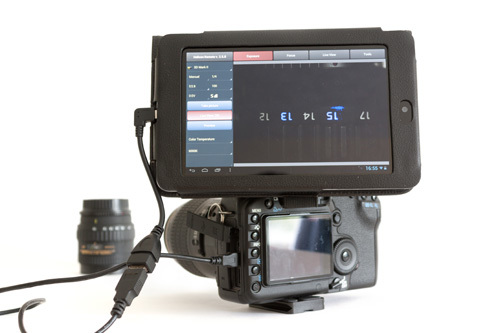 So, why would you actually want to use a tablet to control your DSLR? The main reason is more for videography than photography. An android tablet like the Nexus 7 can be used to view the liveview output of the camera, instead of using a field monitor. The price of a field monitor and the Nexus 7 are not much different, but the Nexus 7 is much more flexible, as well as letting you change camera settings on the screen. It can also be useful if you want to put the camera somewhere where it is difficult to see the camera's screen, e.g. on the ground or up higher. This is more of an issue with cameras that don't feature tilting LCDs. By using an android tablet you add a very large tilting LCD that can also be removed from the camera completely (though of course it must be connected by wire). With more cameras coming with built-in Wi-Fi, and camera manufacturers working on remote control apps, in the future this might be great for street photography. In this aspect I am thinking more of controlling the camera with a phone than a tablet. You could have your camera at your hip, then see the liveview feed and take photos using an app on your phone. Instead of shooting from the hip with a preset focus, being able to control the camera remotely would open up many more possibilities. One idea I would like to try myself is a shoe cam, i.e. taking photos from the perspective of a shoe / foot. It would just be a case of mounting the camera to your foot or ankle, and then controlling the camera via an app. As this would require an autofocus lens, it is not something I can try myself at the moment. Great idea, greetings from spain! Very nice mounting option! I want to try that too. I used general purpose contact adhesive. This seems to provide a much stronger bond than general glue. Contact adhesive glue shouldn’t dry out and peel off in the future like UHU all purpose glue sometimes does. I’m thinking of trying this with a nexus 10 – do you think the hotshoe etc. can hold up to the heftier tablet? I think it should be okay, so long as the camera doesn’t get shaken around much. Ideally you’d have the camera mounted in a DSLR cage, and then the tablet attached to the cage rather than the camera’s hotshoe. But of course, that’s extra cost, weight, and bulk. perfect article with great info.